MISBEHAVIN’ – Summer School success! Misbehavin’ at the Mercury Theatre! Misbehaving’ was a week-long summer school, inspired by the musical Ain’t Misbehavin’, for young people aged 11-16, to work across the five disciplines associated with Hip Hop with professionals such as graffiti artist Brave One, rapper Kenny Baraka and beatboxer Randolf Matthews to learn new skills and develop their talent. Enthusiasm, curiosity and desire to create something new was awe-inspiring and infectious in the five areas of Hip-Hop: Mc-ing, Beatboxing, Street Art, Break Dancing & Music Making. 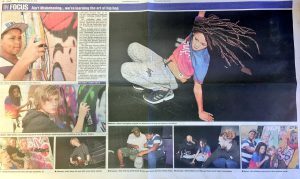 The course took place at the Mercury Theatre in Colchester and was recently featured in the Colchester Gazette.